More Efficient Lower Noise and Higher Airflow EC Fans - Rosenberg USA Unveils Major Expansion Of Electronically Commutated Fan Lines - Rosenberg USA has introduced several new models of electronically commutated (EC) fans in axial and backward curved radial configurations. Rosenberg’s expanded EC range now includes new sizes and designs that deliver increased efficiency, lower noise levels, and higher airflow. Now available 10 sizes from 250 mm to 710 mm (approximately 10 to 28 inches), Rosenberg backward curved EC fans produce airflow up to 9,300 CFM or static pressure up to 6.75 inches. 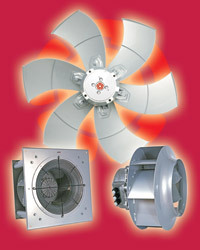 They can be specified as either motorized impellers or as fan modules. Rosenberg’s new EC axial fans feature finned blades that reduce noise and increase efficiency. They come in five sizes from 630 up to 1000 CFM (25 to 40 inches) with top airflow of up to 19,500 CFM. They can be installed in any position and speed is 100% infinitely variable. Applications for Rosenberg EC fans include use in heat pumps, forced air heaters, condensers, cooling units, evaporators, and chillers. Rosenberg’s EC fans feature long-life, low-temperature “brushless” DC motors that are controlled by maintenance-free electronic circuitry. With reduced mechanical content, the fans run cooler and quieter, require little or no maintenance, and are easily speed-controlled. Rosenberg EC fans can be connected directly to a pressure sensor or a thermometer for closed-loop applications. In main-secondary designs, the output of the main fan controls secondary unit speeds. Networking is simple using a computer with an RS485 interface. Shop Cooling FANS for LE$$ / Price list Click here!